The rarity of this 20-24HP Horbick is perhaps not surprising. The cars were made by Horsfall & Bickham Ltd in Pendleton, Manchester – but only between 1902 and 1909. The company’s principal product was textile machinery, and manufacture of motor cars was only ever a sideline. Nonetheless, this picture of a 20-24HP Horbick was accompanied by some more details: a four-cylinder engine of 4,179cc displacement, with mechanically-operated valves, and variable inlet-valve lift provided by sliding wedges between the valve stems and the tappets, “somewhat on the principle rendered familiar by the Vauxhall cars.” This last fact led us to wonder about the origin of the engine. After starting with M.M.C. engines in a 1900 prototype, and later using 2-cylinder Forman engines in 1903, for 1904 they used a Johnson, Hurley & Martin 2-cylinder engine for the Horbick Minor. But by the time of our picture Horbick appear to have turned to White & Poppe for their 3-, 4-, and 6-cylinder engines. A particular identifying feature of a Horbick is the double-curved bonnet that follows the shape of the radiator – similar to that of a Brasier – and possibly many other cars. A frontal view of a 20-24HP Horbick can be seen in Grace’s Guide on the Horsfall and Bickham page. The demise of the Horbick car was simply a decision to stick to the business that Horsfall & Bickham knew best. 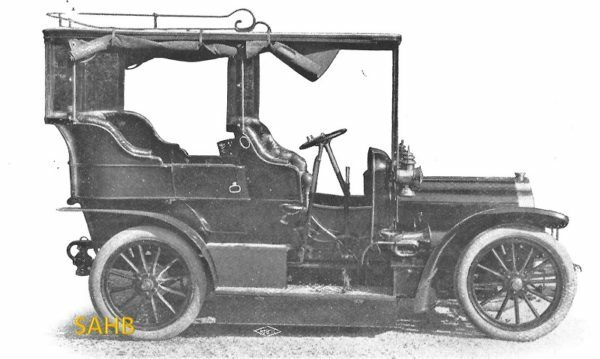 Horbick was already making taxicabs, and an order for 2000 for London forced the directors to decide that expansion of the car-making division would be to the detriment of their textile business. I’ve been intrigued by the history of Horbick cars for long enough – a make local to me. But it was only in the last year that I heard that a Horbick 4-cylinder engine still exists – in Australia of course. No complete car or other parts ever have come to light. In the hands of a leading enthusiast in the Melbourne area, the engine is indeed a White & Poppe as above, it’s Horbick connection shown by a brass plate that is riveted to the crankcase. No, it isn’t for sale! This engine was one of a collection of assorted early car components that previously had passed from hand to hand within the veteran car enthusiast community, and its source cannot now be traced. The fine SAHB Horbick photograph is one I have not previously seen. My dad also worked for the company as manager for a few years. Unfortunately, he passed away earlier this year. I have been given by my mum quite a lot of items to do with this car. A newspaper cuttings book which is filled with clippings about the car starting from 1902 till 1905. There are also photographs, booklets on the engine and carburettor and what looks like original type written sales brochures. I would like to sell these items on behalf of my mum and was wondering if you could recommend the best way to go about this?